This plum sorbet is gonna change your late summer stone fruit strategy. So easy. So elegant. Ice cream maker not required. *Can I Substitute Pluots For Plums? 1. Preheat the oven to 350ºF (177oC) and adjust the rack to the middle position. Line a rimmed baking sheet or a roasting pan with parchment paper or foil. 2. Cut the plums in half. Don’t worry about removing the pits. Arrange the plums in the prepared pan, cut side up, and sprinkle with the sugar. Split the half vanilla bean in half lengthwise and cut each piece in half again. 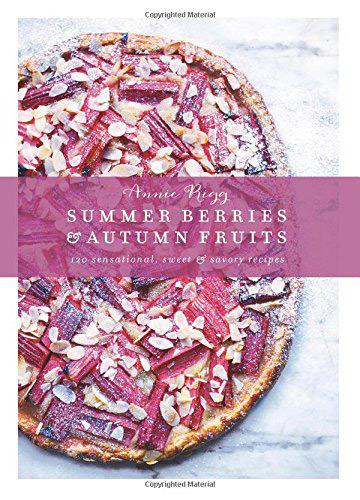 Tuck the vanilla pieces and cinnamon stick among the plums and roast until the fruit is very tender, juicy, and starting to caramelize at the edges, 30 to 40 minutes. Let the plums cool to room temperature. 3. Grab a spoon and a halved plum and hold them over a bowl. Scoop the fruit from the peel and let the fruit and any juice drop into the bowl. (If you prefer a darker colored, tarter flavored sorbet, you can leave the peel intact.) Repeat with the remaining plums. Discard the skins along with the pits, cinnamon stick, and any vanilla bean pieces. Blend the plums until smooth with an immersion blender or in a food processor. If a silky smooth sorbet is desired, pass the mixture through a fine-mesh sieve. 4. Pour the cold water into a saucepan and add the granulated sugar. Bring to a boil over medium heat, stirring to dissolve the sugar. Simmer for 2 minutes and then remove the pan from the heat and add the roasted plum purée. Let cool to room temperature. 5. Cover the plum sorbet mixture and place it in the fridge until chilled through, at least 1 hour. 6. If you have an ice cream maker, churn the plum sorbet in the ice-cream maker according to the manufacturer’s instructions, at least 20 minutes. Transfer to a resealable container, cover, and freeze until firm, about 4 hours. If you don’t have an ice cream maker, simply freeze the mixture in a shallow container, such as a roasting pan, whisking it every hour or so to break up the ice crystals. Once the sorbet is frozen, break it into manageable chunks, transfer it to a food processor, and blend until smooth and light. Place in a resealable container, cover, and freeze until firm, about 4 hours. 7. When ready to dive into your plum sorbet, remove it from the freezer and let it rest at room temperature for 5 to 10 minutes prior to scooping and serving. 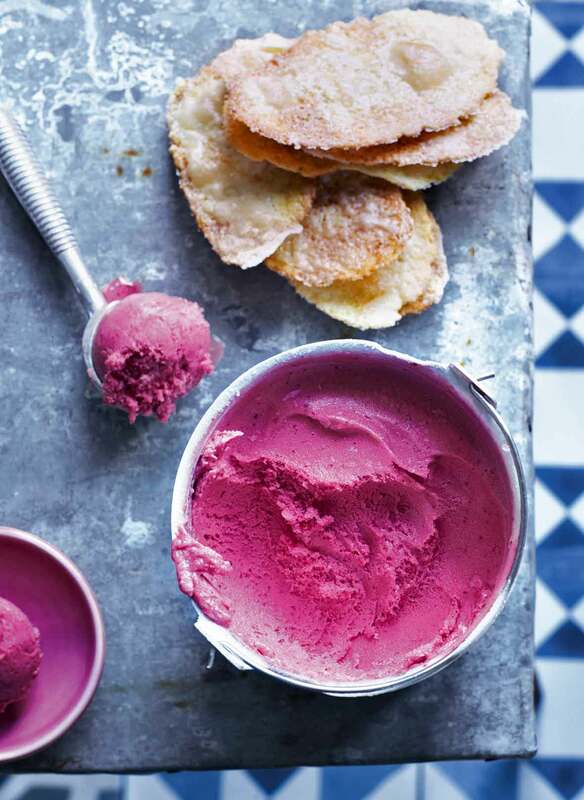 This plum sorbet recipe is wonderful. Absolutely delicious. I heard "YUM!" and "In the top ten most delicious tastes of my life!" and "Is there more?" from my taste testers. And it's gorgeous to serve. We used black plums and the resulting sorbet was a deep, satisfying, rich dark pink with little dark speckles from the skin. The roasted plums were caramel-y and wonderful and tart and full of vanilla-cinnamon scents. They would be fabulous on their own with cream or creme fraiche or ice cream. We prefer our sorbet a bit mushy so we allowed it to sit at room temperature for about 5 minutes before eating. Highly recommended! Plums have always been a favorite summer fruit of mine and this plum sorbet recipe proved to be simple way to enjoy them as a sweet, lightly spiced, refreshing treat. I don't have an ice cream maker but this recipe was easy enough to make without one. The recipe states that the pits can be removed after roasting but I found it far easier to remove the pits from firm fruit than from the very soft roasted plums. My red plums were less ripe than desirable and quite tart. The amount of sugar used may need to be adjusted depending on plum quality. If not using an ice cream maker, I recommend a dish that is more wide than tall. This allows for more even freezing. I stirred my fruit about once per hour and the sorbet was completely frozen in 3 to 4 hours. I also roasted my some extra plums later that night as an accompaniment to roast pork. That time I used of mixture of sugar and cinnamon to sprinkle on the plums and in addition to the vanilla bean I threw a few whole cloves in the pan. Whipping the roasted plums with a fork resulted in a consistency similar to chunky applesauce and eliminated the frequent stirring on the stove that applesauce usually requires. I tried this plum sorbet recipe because my husband really likes sorbets even though I much prefer ice cream. I was pleasantly surprised to find that I would rank this high among any of the ice creams I've ever tried. It was absolutely delicious! I used pluots instead of plums because when I went to the store that is all I could find and it turned out quite well. However, it was lighter in color—more pink. I chose to leave the skins in and I'm glad I did because it brings out the real fruit in the sorbet. I also chose to just use the whole vanilla bean since I figured any extra vanilla would only add to the sorbet. I also scraped the seeds out after roasting and threw them in the puree, which gave it just a little more vanilla flavor. When I went to chill the sorbet before churning, I left it overnight as I always prefer to be careful that it is fully chilled. It also makes it easier to make it the day before you want it and you can then churn it just before serving. I churned it in a 1.5 quart ice cream maker for half an hour, thinking it would be plenty large. It worked, but was overflowing some at the end, so if you can make it in a larger bowl, I would recommend it. It turns out very light and fluffy and expands more than I anticipated. Overall, this recipe is fantastic and I am excited to try it with other fruits! Peaches are the next on the list! Plum amazing! This very simple recipe delivered the best sorbet I have ever made. Fresh fruit in season—exactly why I love making sorbet and ice creams in the summer. I think you could make this with any varietal of plum and have a similarly ethereal result. I found firm red plums available (it is still early, so later I hope to make this with Santa Rosa Plums as well). The spicing is subtle and with the roasting develops a beautiful flavor. The simple syrup does not interfere with that plummy flavor at all, it just brings it forward. I roasted and pureed the plums the day before, giving the sorbet mixture overnight in the fridge to thoroughly chill. It came out of the ice cream maker with an almost fluffy, marshmallowy texture. I would not change a thing. Make space in your freezer for this sorbet, and plan on a repeat while plums are in season. It came out fluffy, a paler shade than the purée, flecked with bits of skin, which also gave a sweet-tart note of their own. If you have extra plums, I would roast them exactly the same way to serve with yogurt or fromage blanc or over homemade vanilla ice cream. Lush as the fresh fruit is, roasting is a flavor multiplier. We enjoyed this plum sorbet during our first heat wave of the summer. The flavor is a little tart and I found it to be very refreshing. I churned the sorbet for 20 minutes in my hand-crank ice cream freezer, which I think was a little too long because some parts of the mixture were crumbly. However, I loved the flavor and will definitely be making this again. The roasted plums weren't terribly sweet. If I wasn't using them for sorbet, I would use them with oatmeal, yogurt, ice cream, or pound cake. The recipe states that it serves 6 to 8. In our house, it's more like 4 servings, but we are ice cream and frozen dessert fiends, so maybe in a normal household 6 servings would be reasonable. Once in the freezer, it took 4 hours to firm up completely. In order to scoop it for serving, it needed 10 minutes on the counter at room temperature for best results. Roasted Plum Sorbet Recipe © 2016 Annie Rigg. Photo © 2016 Tara Fisher. All rights reserved. All recipes and photos used with permission of the publisher. Wow this plum sorbet looks HEAVENLY! I adore plums and just bought a bunch and now I know what to do with them – thanks for the inspiration!!! You’re very welcome, Stephanie! Love to know what you think! What are the little crisps in photo? Lynn, they weren’t mentioned anywhere in the book but my guess is they’re a variant on these lovely Spanish olive oil tortas that are sorta like incredibly delicate cookies. They shatter easily and deliciously and are quite difficult to stop noshing once you’ve begun! It felt a little sacrilegious initiating my ice cream maker with something other than a classic vanilla ice cream, but fresh fruit was calling. Roasting with cinnamon, sugar and vanilla beans was such a simple process, and produced an aromatic, rich plum with sunset colors. As a tester’s review suggested, I scraped the vanilla seeds into my fruit base as well, and retained a couple of skins for color and more flavor depth. Interestingly, my black plums were not even quite ripe, really, but roasting brought out their plumminess nonetheless. I just roasted them about 15 minutes longer than the recipe directed. I also collected as much of the sticky juice from the parchment paper as possible to add to the fruit paste. I cut back on the sugar in the simple syrup by nearly one third after tasting the roasted fruit and I’m glad I did. I had no issues with the quantity of sorbet being more than the ice cream maker could accommodate. In fact, I think that the sorbet was appropriately frozen and freezer-ready in just under twenty minutes. At serving time, the sorbet had a richness that I would not have expected from a sorbet. It was smooth, just tart enough to be refreshing, and a great inaugural run for my ice cream maker. Thank you! Lovely, Judith, thank you so much! Oh, please, the pleasure was all mine (and my husband’s, and my son’s)–and there’s a little, tiny bit left! I hope you hid it so it doesn’t disappear before you go back for it, Judith! . . .I actually did! Hah! A lady after my own heart. Kindred souls, Judith.